Rubbing one of these smooth bars between your palms creates enough heat to release a lotion for dry skin. How do you turn a solid into a liquid? Science. But Priya Buge has figured that part out already—all you need to do is rub one of her silky smooth bars between your palms, which creates enough heat to release a lotion for dry hands, heels, elbows, knees, and lips. There's no liquid to spill, so confidently keep a tin in your bedroom, purse, carry-on, or office drawer. Each bar is loaded with cocoa and Shea butter, organic coconut oil, beeswax, and scented essential oils that promote relaxation and balanced moods. The set includes four varieties—Lavender, Rose & Ylang Ylang, Citrus, and Matcha Green Tea-Jasmine—colored from plant root powders infused with olive oil. Handmade in Indiana. Massage the lotion bar in between palms or onto the skin. Allow the body heat to melt the natural butters and oils for the super moisturizing effect. Feel the aroma of the essential oils. People in my office are constantly complaining of dry skin, but a lot of our work involves travel. So it's great to have lotion that you don't have to worry about spilling or getting confiscated by TSA. 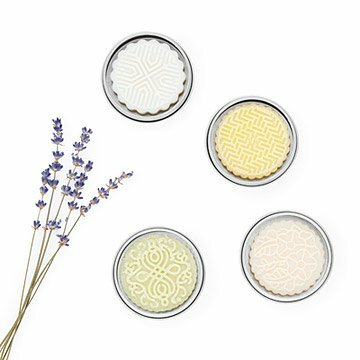 I love the lavender and rose scents and thought the product was beautifully assembled - it was a shame to separate the tins but they were going to separate relatives. Wasn't sure how long the products sat in warehouse - production date to delivery. The more delicate citrus and rose scents seemed a tiny bit stale. Would def purchase again maybe for me next time. Great portable way to carry hand lotion that is so fragrant and will not spill in purse or desk drawer. Boxed so nicely. My daughter-in-law was very appreciative. She loved the scent of each one. Timely shipping and my friend loved it! Good experience, helpful customer service, lovely packaging. This is a great gift for women. Unique.